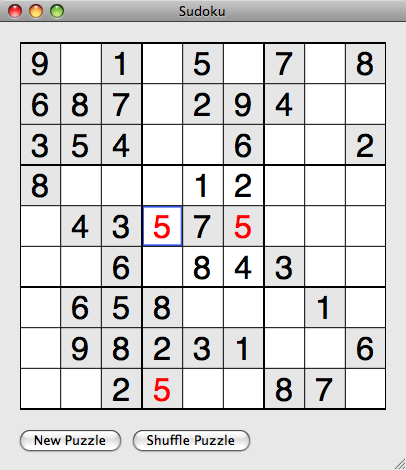 I wrote a simple Sudoku puzzle game for Mac OS X.
Predefined cells which cannot be changed are indicated by a gray background. Invalid cells are drawn in red. At any time you can reset the grid and create a new puzzle or shuffle the existing puzzle. Shuffling randomly reorders rows and columns such that the numbers remain valid; perhaps looking at the same puzzle in a new way will make it easier to solve. If you want to play, download the application. The latest version is 1.0.4. It should run on Mac OS X 10.4 or later. If you want to see how it works, you can also download the source code. The source code is not needed if all you want to do is play.